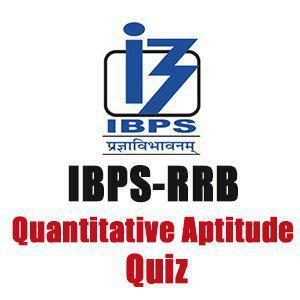 Mahendra Guru September 16, 2018 Important maths questions for PO, Quantitative Aptitude, Quantitative aptitude Questions, Quantitative Aptitude Questions For IBPS RRB PO/Clerk. Q1. The price of the sugar is decreased by 20%. If Naimish decreased his expenditure on sugar by 25%, then by what percent Naimish can decrease/increase his consumption? चीनी के दाम में 20% की कमी आई हैं। यदि नैमिष अपने चीनी पर होने वाले व्यय को 25% से कम करदें तो नैमिष के चीनी की खपत में कितने प्रतिशत की कमी/वृद्धि होगी? Q2. A shopkeeper sells three items P, Q and R and incurs a loss of 21%, 11% and 10% respectively. The overall loss percentage on selling P and Q items is 14.33% and that of Q and R items is 10.4%. Find the overall loss percentage on selling the three items? एक दूकानदार को तीन वस्तु P,Q और R पर क्रमश:21%, 11% और 10% की हानि होती हैं| P और Q वस्तु पर कुल हानि 14.33% है तथा Q और R पर कुल हानि 10.4% हैं। तीनो वस्तुओं की बिक्री पर कुल हानि प्रतिशत ज्ञात कीजिये ? Q4. One quantity of sugar at Rs 9.30 per Kg is mixed with another quality at a certain rate in the ratio 8:7. If the mixture so formed is sold at Rs 12 per Kg, what is the rate per Kg of the second quality of sugar, if the mixture is sold at a profit of 20%? 9.30 रू प्रति किग्र मूल्य की चीनी की कुछ मात्र एक निचित मूल्य की दूसरे प्रकार की चीनी से 8 : 7 अनुपात में मिलायी गयी और मिश्रण को 12 रू प्रति किग्र की दर पर बेचा गया, दूसरे प्रकार की चीनी का मूल्य प्रति किग्र क्या हैं , यदि मिश्रण को 20% लाभ पर बेचा गया हैं ? Q6. Three examiner Manish, Puneet, Ajay are evaluating answer script of a subject. Manish is 40% more efficient than Puneet, who is 20% more efficient than Ajay. Manish takes 10 days less than Puneet to complete the evaluation work. Manish starts the evaluation work and works for 10 days and then Puneet takes over. Puneet evaluates for next 15 days and then stops. In how many days, Ajay can complete the remaining evaluation work? Q7. The average wages of a worker during 15 consecutive working days was Rs.90 per day. During the first 7 days, his average wages was Rs.87/day and the average wages during the last 7 days was Rs.92 /day. What was his wage on the 8th day? एक मजदूर के 15 क्रमंगत दिनों की औसत मजदूरी 90 रू. प्रति दिन है| पहले 7 दिन में औसत मजदूरी रू 87/दिन और आखिरी 7 दिन औसत मजदूरी रू 92/दिन है। उसकी 8 वे दिन की मजदूरी क्या हैं ? Q8. An experiment succeeds twice as often as it fails. What is the probability that in the next 4 trials there will be three successes? Q9. Two men, sitting on the table. One man has 7 eggs and other had 5 eggs. A third man passing by requested them to share their food in return for money. The three of them shared the eggs equally and the third traveller paid the other two a total of Rs 24.Find the difference between the amounts received by first two men? Q10. Three pipes P, Q and R can fill a tank in 6 hours, after working it at together for 2 hours, R is closed and P and Q can fill the remaining part in 7 hours. How much time will R take alone to fill the tank? Having selected two male members, 2 female members can be selected in 3C2 =3ways.